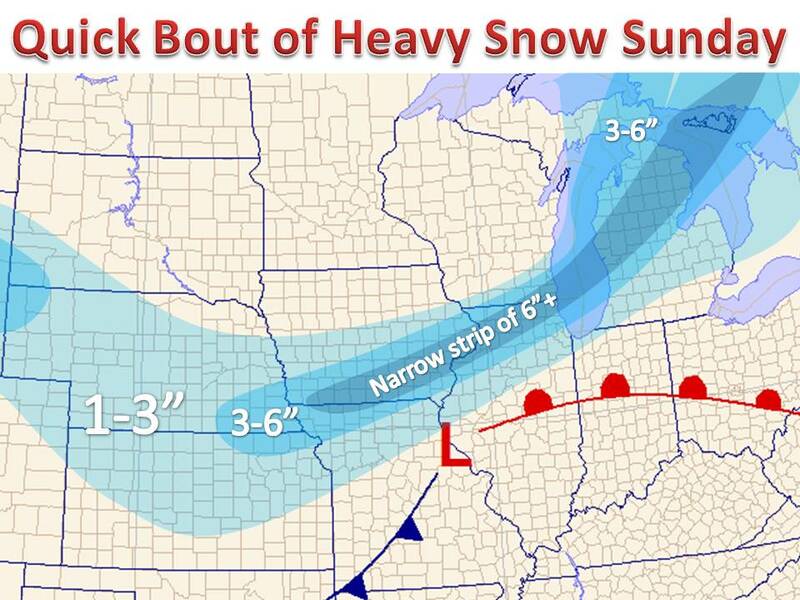 Parts of the Midwest will be digging out from their largest snow storm since last year by the end of the week. 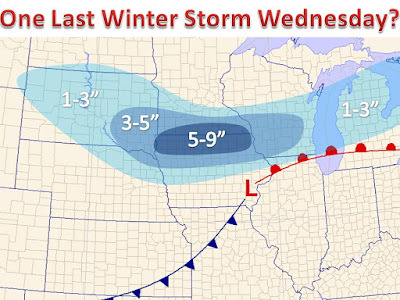 A storm system is expected to develop in the southern Plains Wednesday and slide to the north and east through Thursday and Friday. 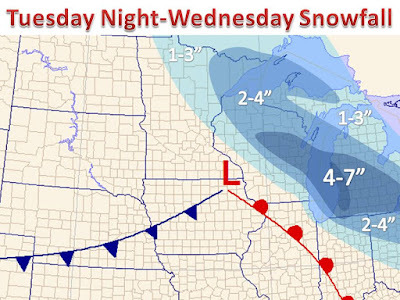 Heavy snow will begin to breakout Wednesday night into Thursday morning as it overspreads the entire Upper Midwest through the day Thursday. 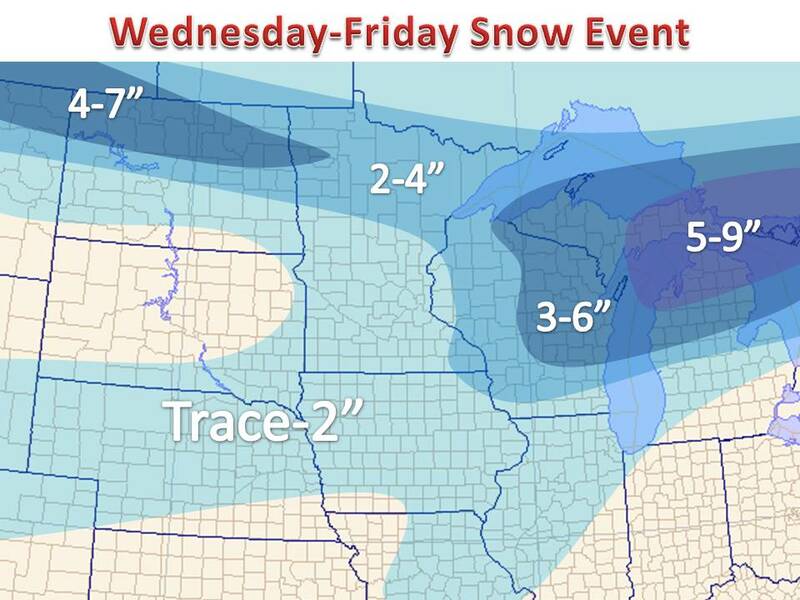 A swath of 6"+ of snow is expected to fall to the northwest of the track by Friday, with rain further east. 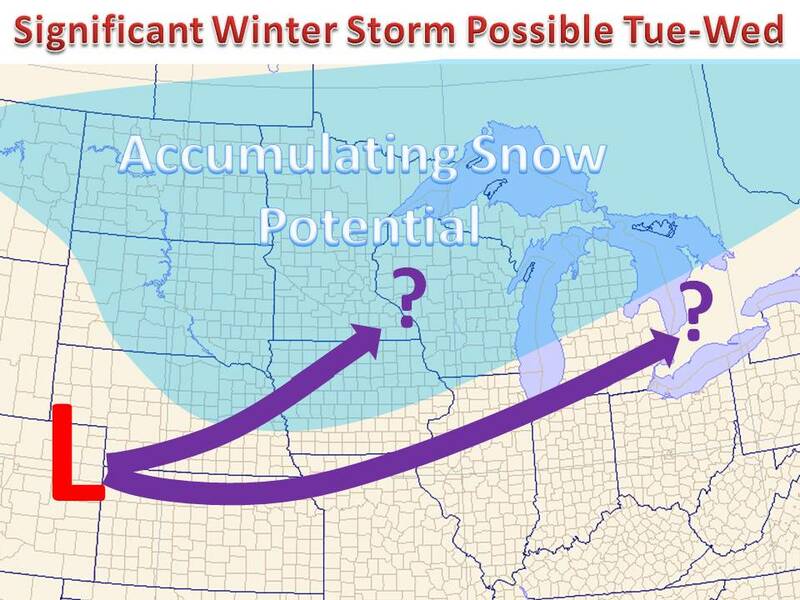 With the storm system still 3-5 days out there are still more questions than answers at this point. 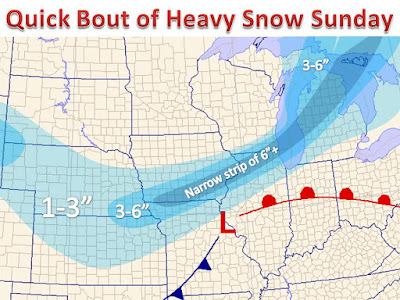 As per usual, the exact track of the low pressure system will greatly determine who sees the heaviest snow and who sees mainly rain. In addition to the usual track error in the models, there are major differences in the temperature profiles of the atmosphere ahead of the system. 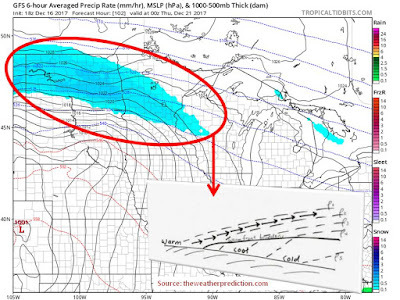 While an area of high pressure is expected to develop north of the Dakotas, there just isn't the amount of cold air in place we would usually have at this time of year. 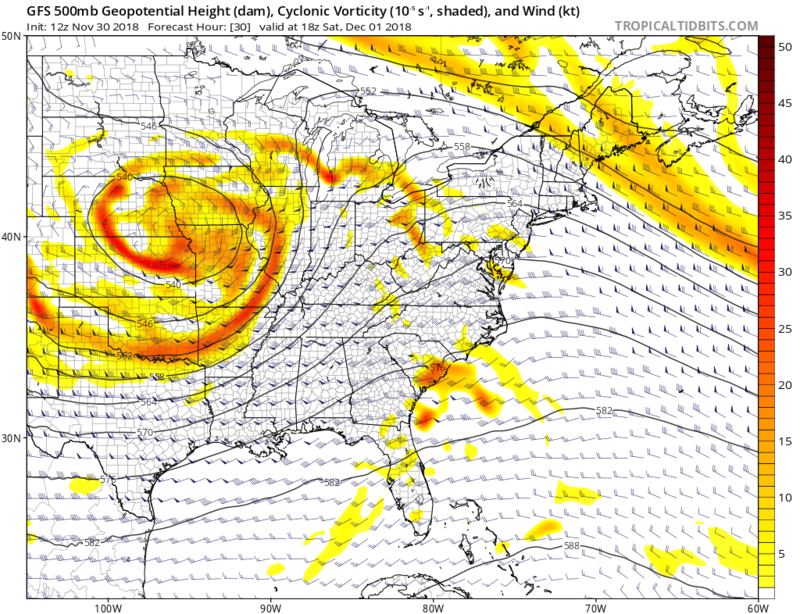 The low will have to generate some of its own cold air through advection and latent heat release. 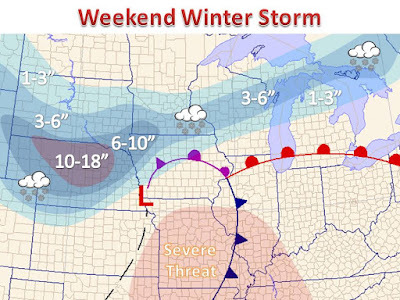 The GFS and the EURO have varying opinions. The GFS for example has a much more saturated atmosphere ahead of the first batch of precipitation, which will impact temperatures as dry air and precipitation can act as a cooler process due to latent heat release. Whereas the EURO model has more dry air to help cool the column ahead of the heavier snows. Furthermore, the grid spacing on the EURO is smaller so will better resolve the cooling process over the GFS, so the cooler solution is currently favored. 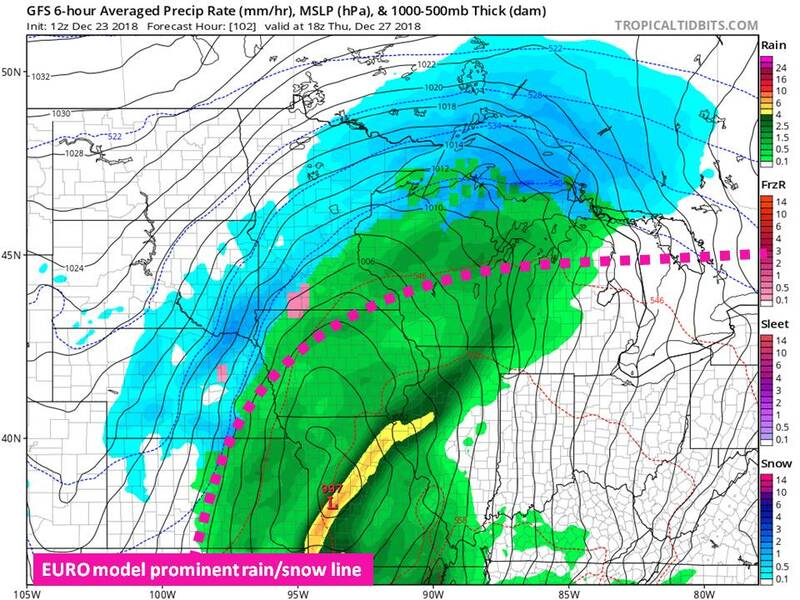 Below is a look at the GFS model, with the main EURO rain and snow line overlayed. 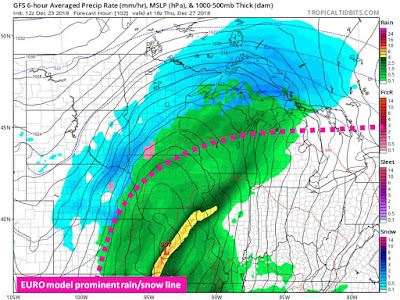 The GFS has a much larger percentage of the storm as rain, while the EURO suggests more snow. Still a lot to work out with this one, so be sure to follow on Twitter and Facebook for continued updates. 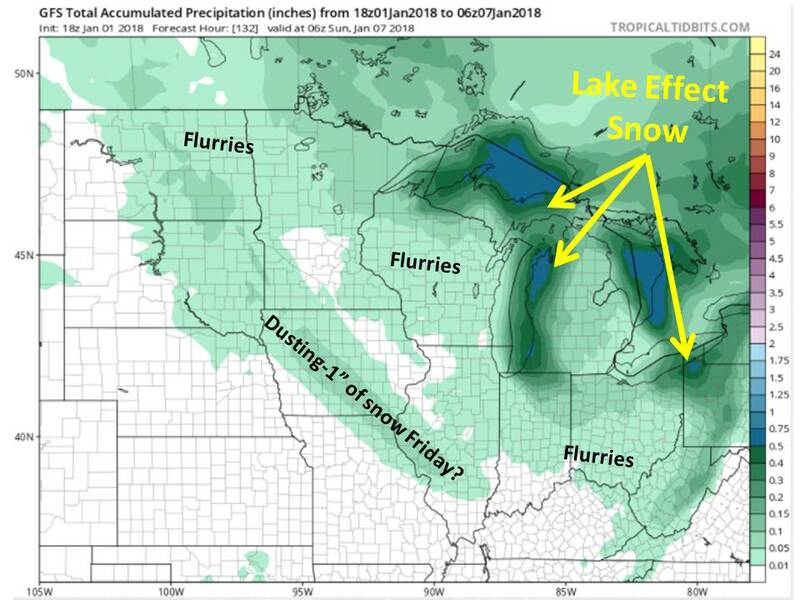 Can always check out the Computer Snow Output page as well. 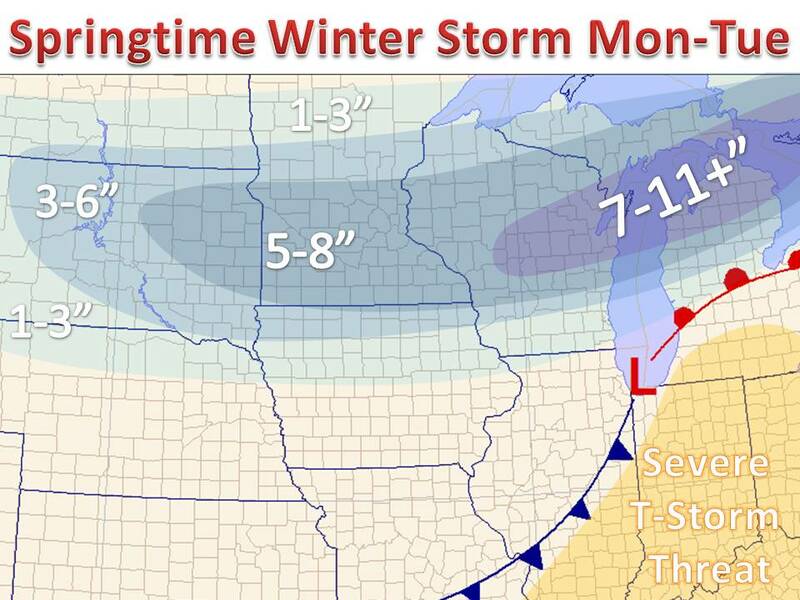 It's about that time, when everyone is asking, what will the winter be like? Well, we have some of the answers you are looking for. 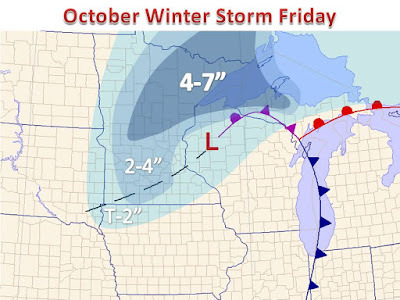 The winter forecast is not as clear cut as some years in the past, but there are some trends out there that show clues into what the fine winter enthusiasts of this site should expect. First, let's start with the process into how the outlook was constructed. 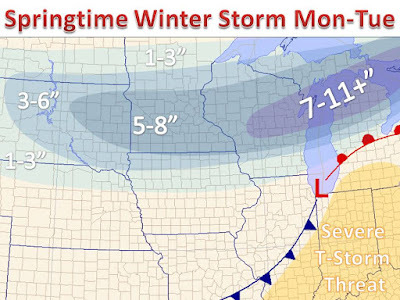 We will use 4 major teleconnections that are useful to forecast the weather out several months to a year in the future. The most influential and most common lies in the level that ENSO is expected to be in. ENSO is essentially a measure of how warm the ocean temperatures are in the Central Pacific. 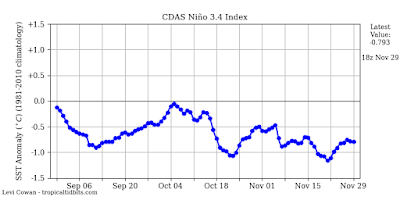 If the specific region is warmer than normal it is classified as an El Nino, colder is classified as a La Nina, and near normal is in the neutral phase. 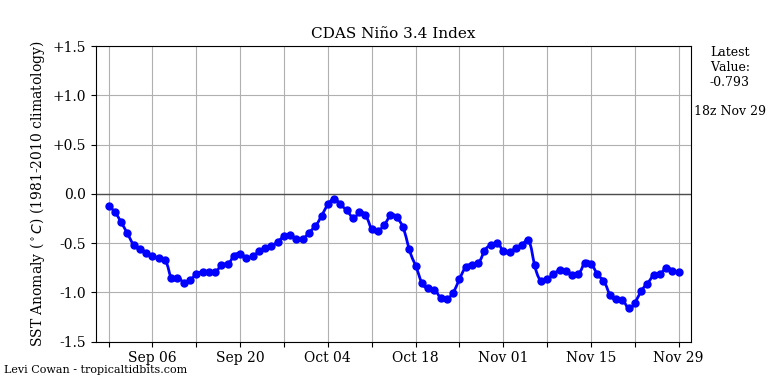 The phase tends to flip from El Nino to La Nina every 8 month to over a year at times. For our purposes in the winter forecast, we are currently in the neutral phase and expected to trend towards an El Nino moving into winter. Consequently, we will only use years that followed the same trend. 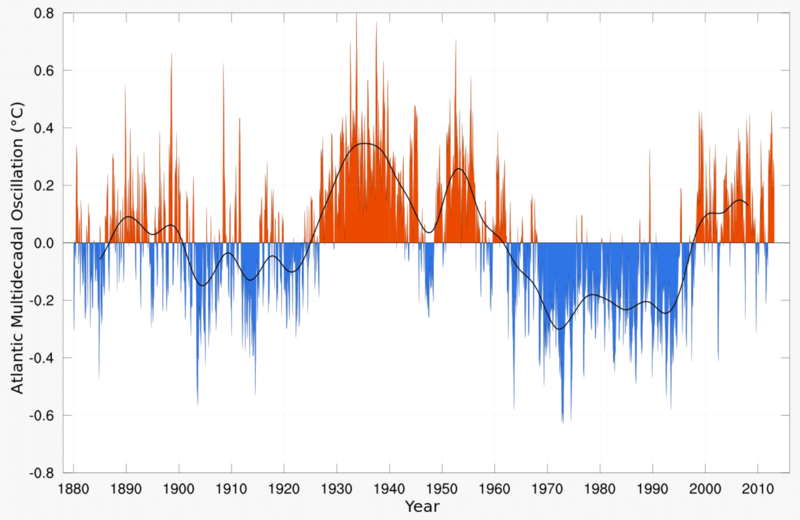 The Pacific Decadal Oscillation (PDO) is a similar measure or oscillation that goes from the warm to cold stage every 5-10+ years, and examines ocean temperatures in the northern Pacific. It is near neutral and is likely to hover around the neutral stage through the winter, we will give it 2x weight. 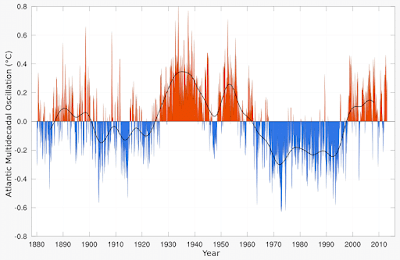 The Atlantic Multidecadal Oscillation (AMO) is similar to the PDO, and should stay in the warm phase through 2019, as its period of change can be well over a decade. Since the AMO is a measure in the North Atlantic, we will use less of a weight, since it is downstream of the weather in the United States. Finally the Quasi-Biennial Oscillation (QBO) is a regular variation in the wind direction near the equator located in the stratosphere and can influence the weather around the world. It is a wind that blows in the same direction for roughly 14 months then completely flips direction. Based on history, the QBO should eventually flip direction, which should occur sometime during the winter, so years with a flip from negative to positive during the winter will be used for the forecast. Putting it all together, 5 similar years since 1950 were looked at then averaged against the values from the entire period. 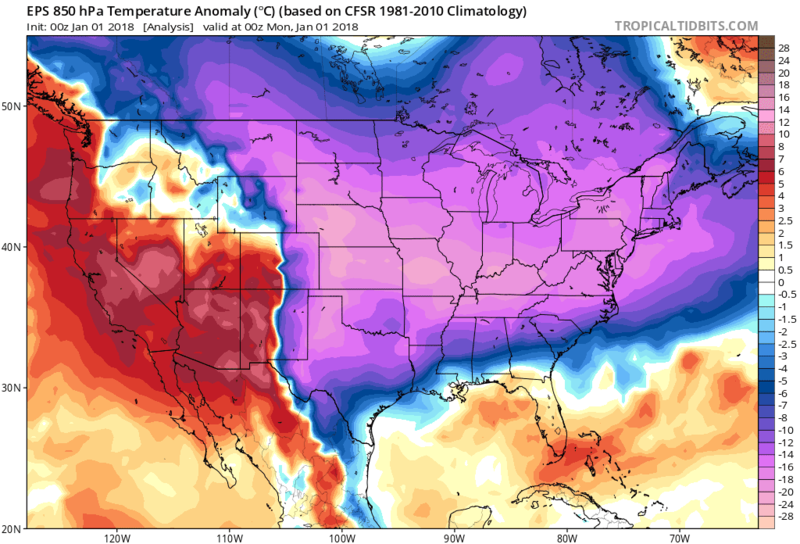 Essentially, the map above is what we may expect in terms of temperatures during the months of December through February this winter. Notice the colder air from the Plains down through the Southeast. 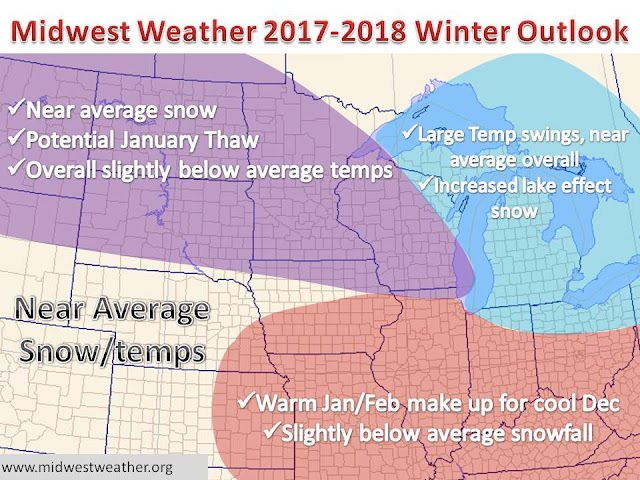 Some warmer temperatures are housed in the Great Lakes, but overall cooler than normal temperatures are expected this winter across the Midwest. Looking and precipitation now, we see an above normal signal across the Midwest, and a well above normal signal across the West Coast. 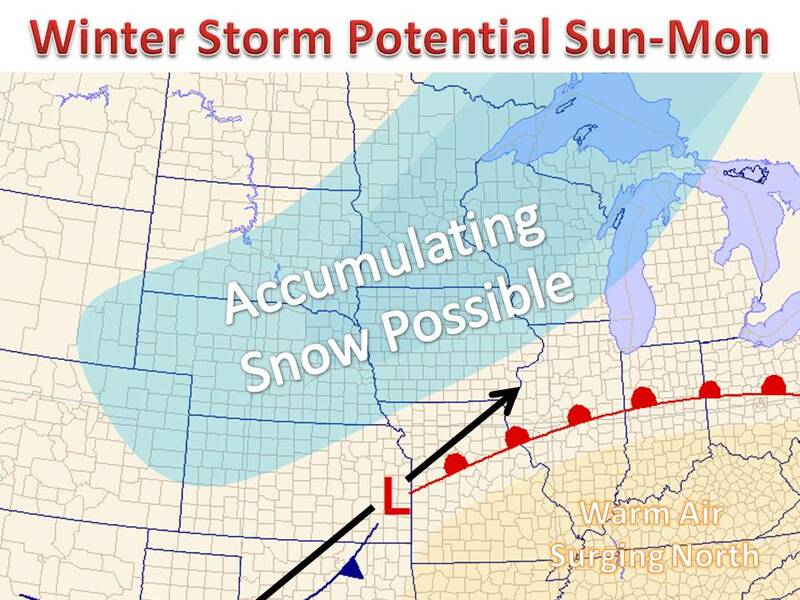 Colder than normal and above normal precipitation will also favor above normal snowfall overall. However, notice there are some southwest to northeast strips of above/below normal areas east of the Rockies. It may signal the risk for larger storm systems, and more hit/miss events in aggregate through the winter season. At the end of the day, slightly above normal snowfall is favored, but as always it will come down to where each individual storm track goes. 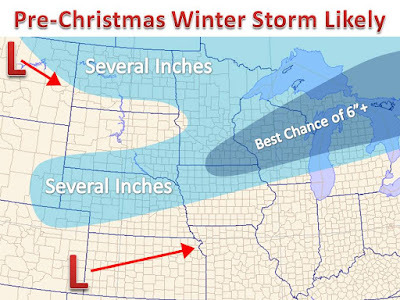 There will be an above normal amount of chances for snow this winter, so be sure to keep up to date with Midwest Weather through the winter, as the blog becomes much more active. You are also going to want to 'Like' us on Facebook and follow on Twitter for continued weather updates and conversation. 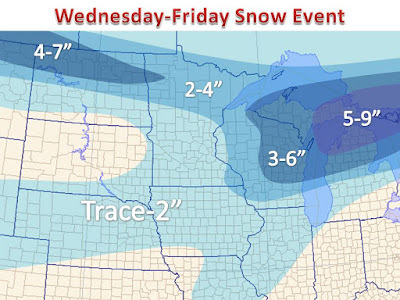 Winter is at it again, more snow on tap for the some of the same locations that saw over a foot of snow over the weekend. 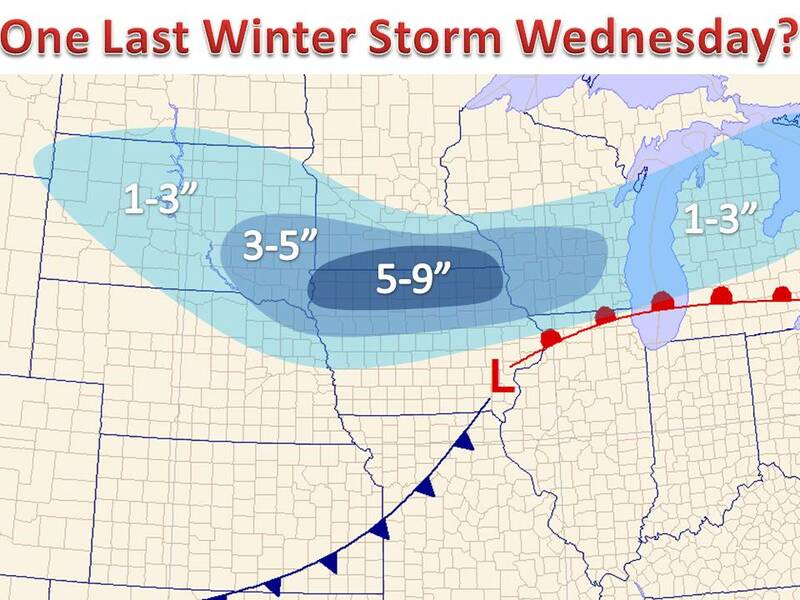 A quick hitting Alberta Clipper system will slide into the region Wednesday and spread a swath of moderate snow to the region. Snow rates of 1-2" are possible for a period during the day, which could be enough to pile up over 6" of snow in spots. 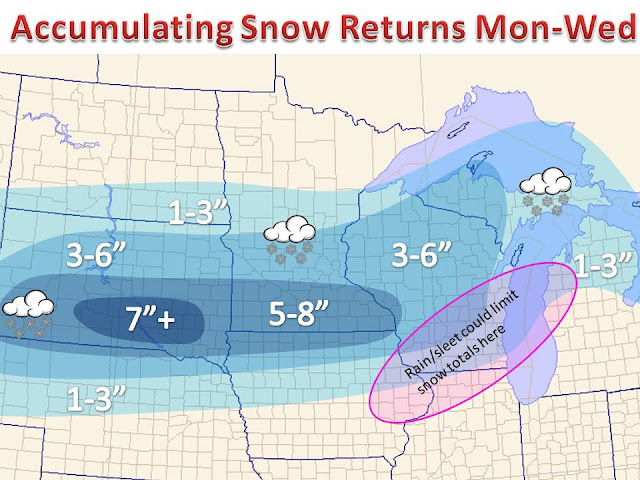 Temperatures will return closer to normal by the weekend and near normal by next week, so the snow will be gone as quickly as it came. Snow will develop by Wednesday across the northern Plains and fill in towards the Midwest by Thursday. 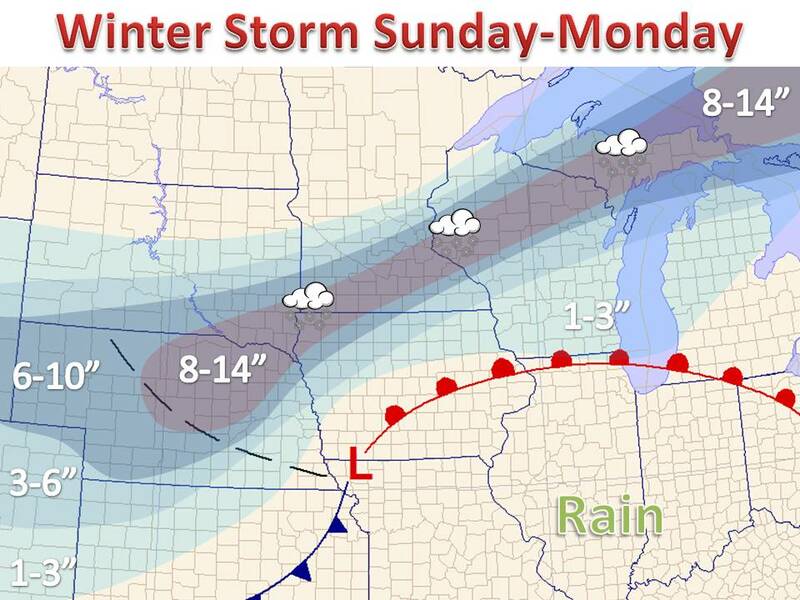 Several inches of snow are possible throughout North Dakota and parts of the Upper Midwest. 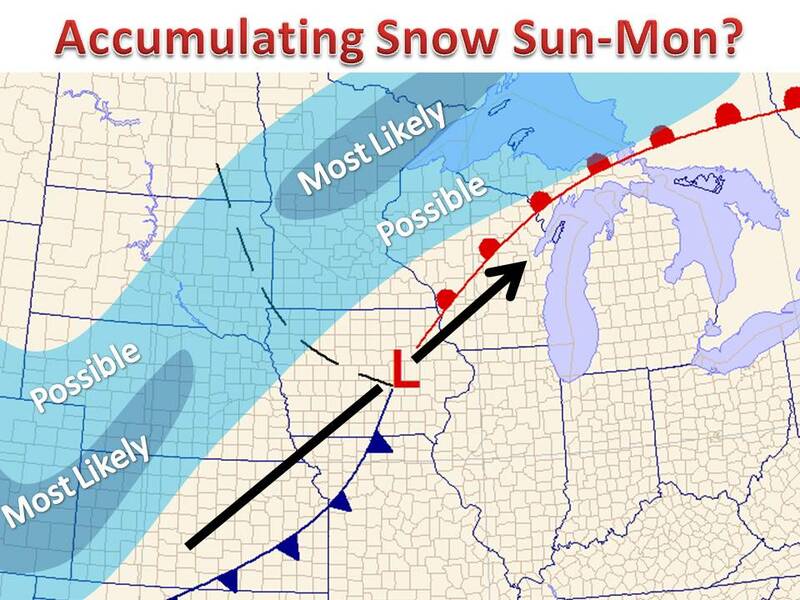 There will be 3 pieces of energy that produce snowfall over the next several days. If they would have all phased together at the same time, which does tend to happen this time of year, heavy snowfall would then have been likely, yet this is what we are left with. The heaviest snow will be over northern North Dakota and Northeast Wisconsin into Michigan. 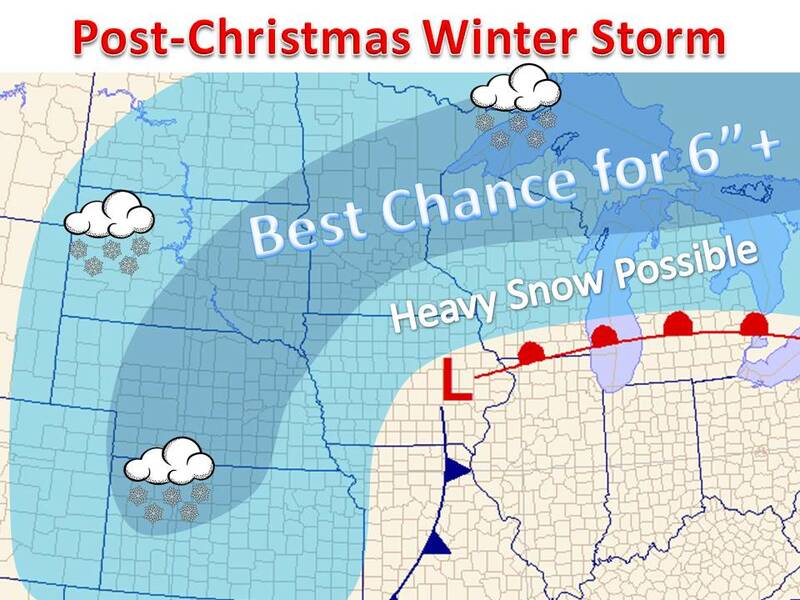 It's that time of year, the time when just about everyone wouldn't mind to see the white stuff falling from the sky. Well, Mother Nature may come through with accumulating snows in the days leading up to the holiday. 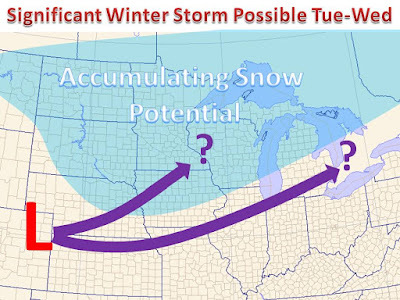 Models have been showing a favorable pattern for days, and are becoming more clear with a couple storm systems ejecting from the Rocky Mountains December 20th-22nd. With a substantial trough in place, the cold air supply with be sufficient to support snow through much of the Midwest. 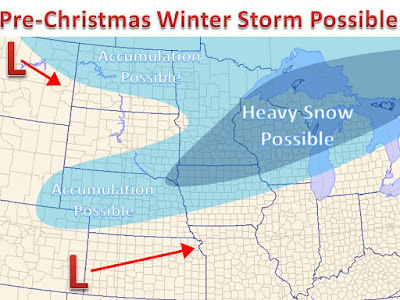 Our first peice of energy will slide out of Montana December 20th and bring warmer air north towards North Dakota and Minnesota. As this warm air is bought over the top of stubborn cold air at the surface, precipitation will emerge once it reaches saturation. 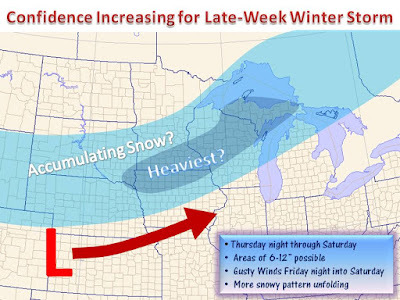 Widespread light snow should develop across much of the northern Plains with a few inches of snow likely across much of the region, and isolated locations of more snow eare possible. The main surface low will weaken and transfer towards eastern Colorado the coming days. 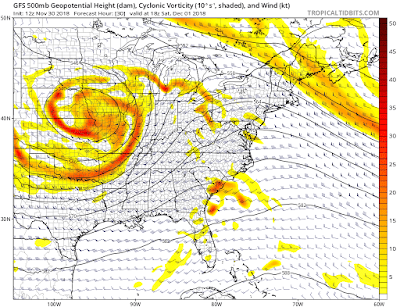 When this energy digs south into the Central Plains by the 21st, a developing surface low pressure system will strengthen as it pushes northeast towards the Upper Great Lakes. As the low deepens, upward motion will be induced on the northwest side of the cyclone, and with cold air in place a large area of snow should develop Dec 21st-22nd. 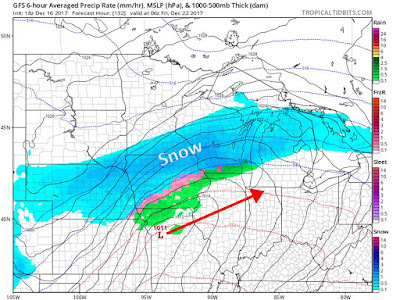 The long duration event and effective dynamics in play, heavy snow is possible somewhere from Iowa to Wisconsin and into Michigan. 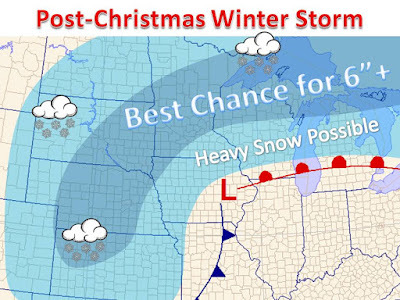 Being still ~5 days out, some details are uncertain, but looks like a good shot for a solid White Christmas across much of the Midwest. 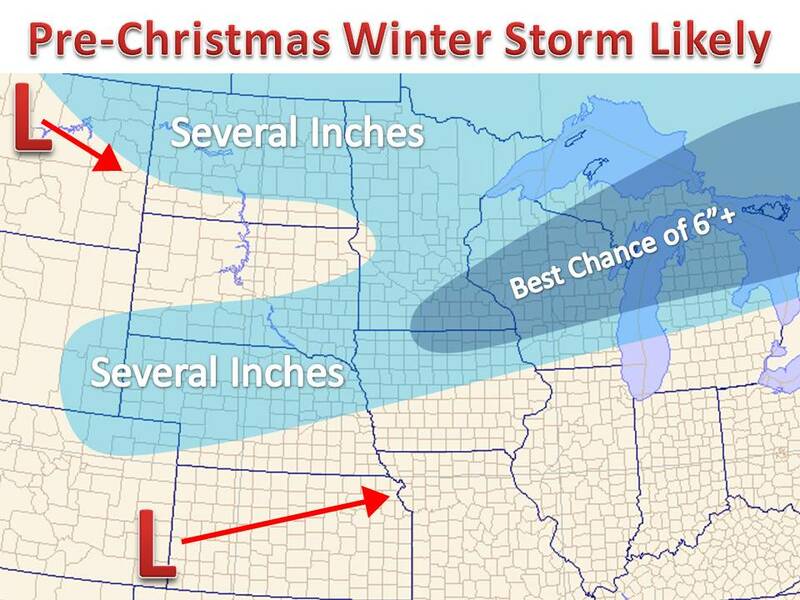 We won't touch on exact amounts quite yet, just being too early at this point, but there is a chance of an area picking up 6"+ as we head into Christmas. 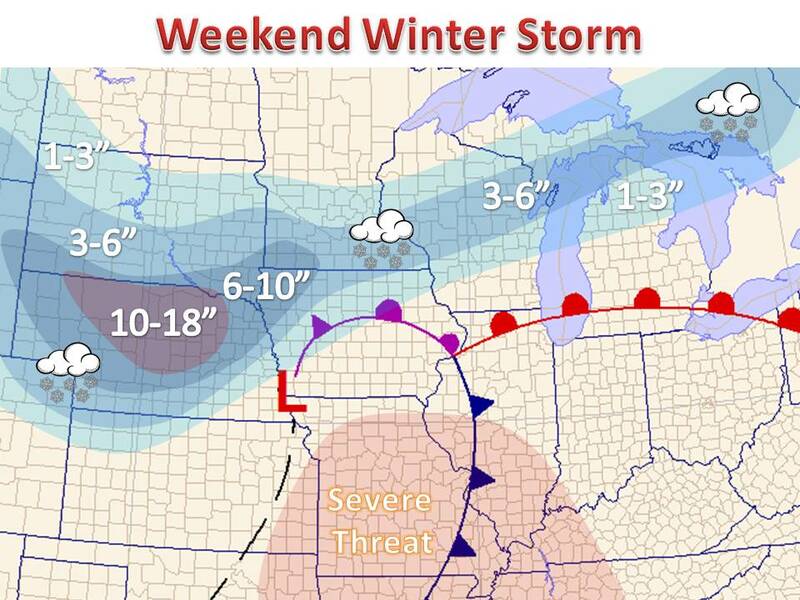 Be sure to keep it here to Midwest Weather for details and snow forecasts as we get closer to the event. You can always follow on Twitter and like on Facebook for even more updates.